Our Sunday brunch centered around falafel. I’ve seen many falafel recipes on the interwebs. Some use canned chickpeas, some add flour, and some add fava beans. My preferred falafel contains ONLY chickpeas, no fava beans. I also like mine to have lots of parsley, onion, and garlic. You can see the greenish cast when you break it in half. Also, once your chickpeas have soaked overnight, and get processed in the food processor with the onions and greens, there should be no need of flour to bind it together. If the falafel breaks up, that means that the oil probably needs to heat up a little more. To kick it up a notch, I love to add radish leaves. I confess that I planted a bunch of radishes this year, just for the greens. They have a slightly peppery flavor,not unlike mustard greens. I plan to freeze some of them for the rest of the year, so I can add to my falafel when I don’t have fresh radishes. And, don’t be squeamish about the garlic peel, just add the whole clove, peel and all. 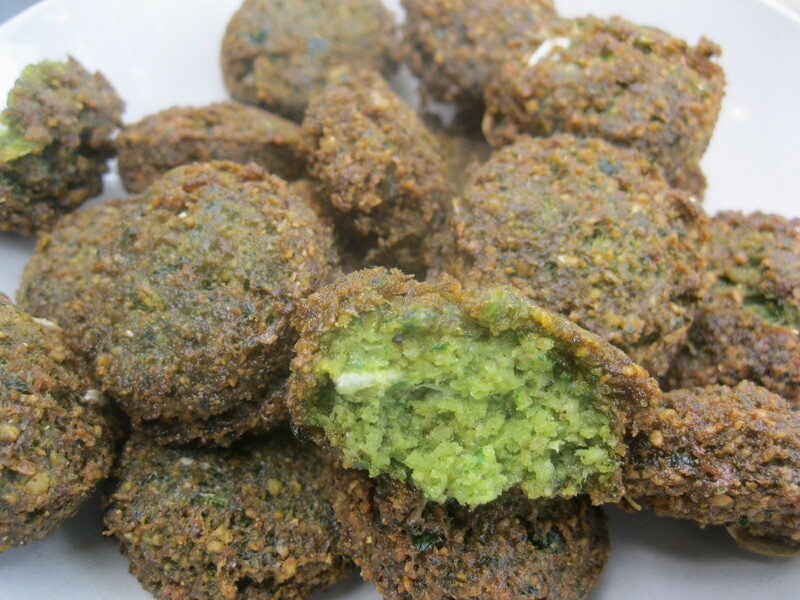 It contains antioxidants and has no discernible texture in falafel, as it gets well processed. By garlic peel, I mean the shiny peel right on the cloves, after you peel away the papery skin. This requires some pre-planning, as you have to soak the chickpeas in advance. Other than that, though, it is not hard to make. You whir in the food processor, shape, and fry. Then you get to eat some wonderful, fresh falafel. Place all ingredients, except baking soda, in a food processor. 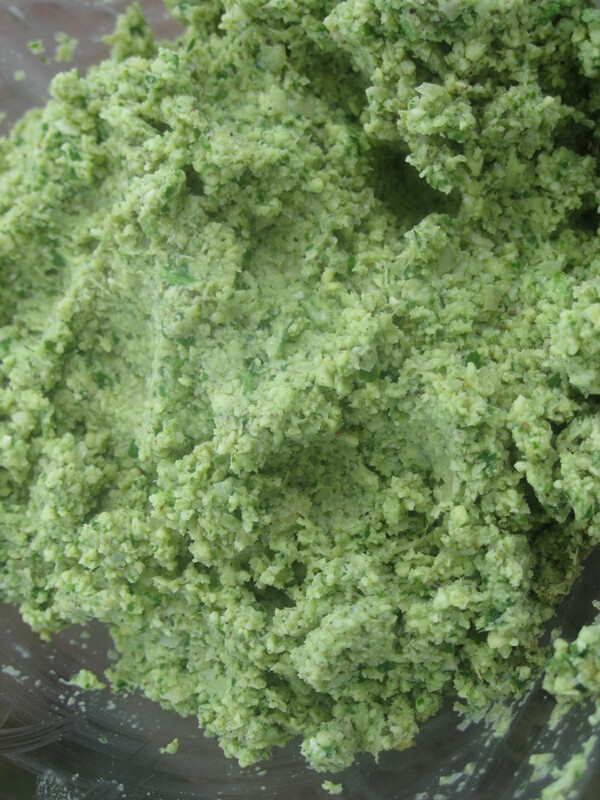 Process well, until uniformly light green, and the chickpeas are processed to the size of bread crumbs. Over high heat, heat about 2 inches of cooking oil in a deep skillet. Right before frying, mix in the baking soda. To Fry: Either shape using a falafel scoop (can spray some oil on it to keep things from sticking), or shape into balls with hands, flattening to 1½” slider-shaped patties. Wet hands slightly if the falafel mix starts sticking to your hands. 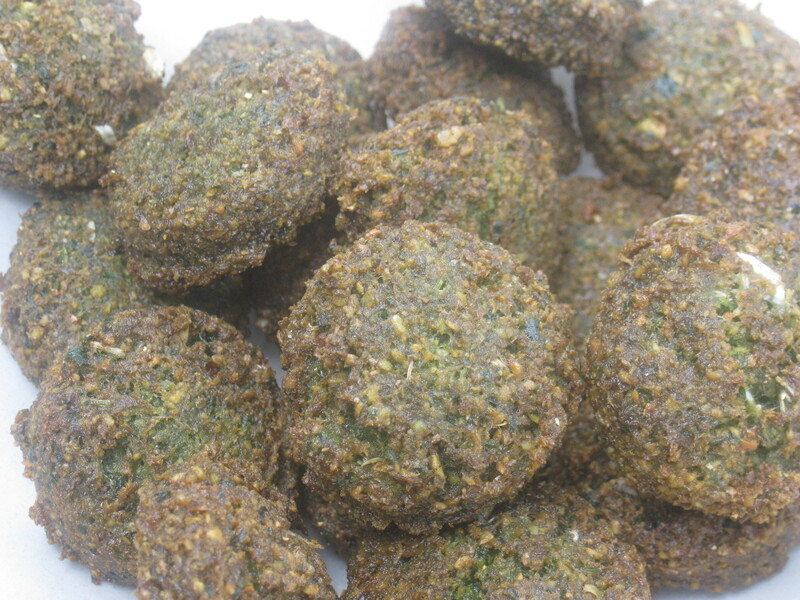 Drop one falafel into the oil to test. It should start bubbling right away. If the falafel breaks up, that means that the oil is not hot enough. Fry 1-2 minutes on each side, until the falafel is a light golden brown. Drain in colander or on paper towels. This made about 24 falafels. Note – you can double or triple amounts, and freeze in meal-sized portions. Place in freezer bags, pressing flat. Defrost in a bowl of water. You’d just want to leave out the salt and baking soda until right before frying. You can make it spicier/hotter than this, but my children do not like very spicy food, so I err on the side of well-spiced, but not hot-spicy. You make it sound so easy! The lentil soup went down very well by the way. I’ll be trying this too when I can face all that frying. Thank you. It really is simple, Safia 🙂 You might lose one or two as you get the temperature right (single falafel balls, not batches 😉 ) . But after that, it is smooth sailing. I am so glad that you liked the soup. I prefer all chickpeas as well – and I love the addition of the radish leaves! Yes, if it is not hot enough, the falafels will start to break apart.